The goal of this project is to build a dynamic backlight, also known as an ‘ambilight’, for my PC monitor. 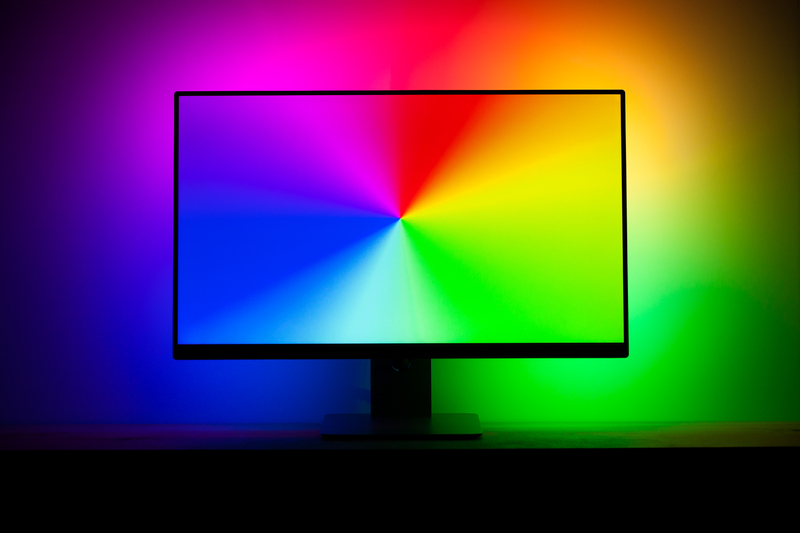 An ambilight changes colors based on the content onscreen, extending your monitor to the wall behind it. By reducing the contrast between the monitor and the background it can also help with eye strain. There are some commercial versions of this product, but I wanted to see if I could make one myself with WS2812B addressable LEDs (also known as NeoPixels) and an Arduino. This was a fun project and I’m really happy with the end result. If you’d like to build your own, I would suggest reading through all of the posts before starting. I’ve also included direct links to the software downloads and a parts list below that you may find useful. I wrote my own version of the Adalight code which works with FastLED and WS2812B LEDs (and, in theory, with all other FastLED supported LED types). The PC software I’m using for screen-grabbing is Patrick Siegler’s fork of Lightpack’s Prismatik, which supports the Adalight protocol out of the box. You can download both of these from their respective GitHub repositories. You can find more information on each of these settings in the framerate and color correction posts above. These settings are current as of: May 21st, 2017. For full disclosure, note that a few of these are Amazon affiliate links that help fund the content on this site. Thank you for your support!